British Columbia Mountaineers (expedition team) at the Judd residence. The present form of Brackendale did not begin to take shape until the subdivision of the Judd property in 1910 into 20 large lots along the Government Road, including the original lot purchased for the Brackendale Store. The original Judd Home itself burnt to the ground in 1916 and was rebuilt as the structure which stands there today as the current home of Mrs Farquharson, one of Henry and Anne Judd's youngest daughters. Henry Judd (or Harry, as he was also known) and his wife Anne were among that small group of settlers which included the Robertsons, the Raes, William Mashiter, E.B. 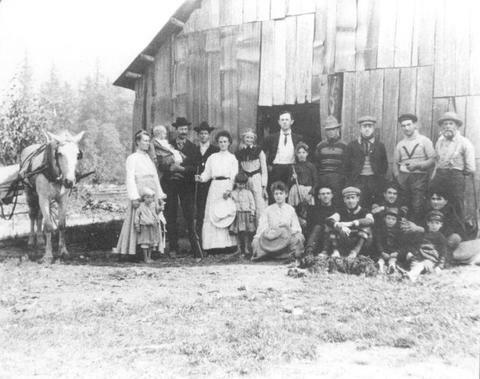 Madill, George Magee, Tom Reid, and a few others who are now regarded as the Pioneers of the Squamish Valley. Having made purchase by public lottery of a major piece of property covering much of what is Brackendale today, Henry Judd arrived in the Valley in 1889 to begin farming his land. Building his original home at the present site of the Brennan Home, Judd sold that house to his parents after marrying Barbara Anne Edwards, who had come to work at the Squamish Valley Hop Ranch. A new home was built by the young couple on the site of the present Judd House. Squamish Public Library (1993). Preliminary Squamish Heritage Inventory.